No training program jump aerobics can not do without the rondat – jump with the coup. This base was the start walkovers, flips, pirouettes, and many other complex acrobatic combinations. From these exercises look pretty simple, but it requires a good physical preparation. Your task – to master the correct technique of rondat, eliminating all the error. Then all subsequent elements will be performed without major errors. - consultation of the coach. Learn how to hold my body in her arms – only in this case you can learn to do rondat. It is recommended to strengthen the hands of regular push-UPS and using free weights classes. Having mastered stand, take the wheel: with the stop on the hands; feet and connecting with the implementation of the 90-degree rotation; with wheel hop followed by a rotation. Attach the previous exercise and begin to learn a jump (courbette) from a standing position to the hands. You need the rapid footwork and push hands, go from the rest position to the standing position. For starters, you can do it from the bench, and then get back on the floor. Only after the preparatory exercises you can try to make rondat. Please note that the start of rondat like a wheel. However, there is a difference in the performance of combinations to the left you need to deploy a right hand to the left hand side. This is the basis of technology. When you take a stand, you must connect the legs and terminate rondat the courbette (without bending legs!). Finally made the jump over. Learn to make rondat in the following sequence:- perform a few steps for a running start, the arms should rise just before the start of the element;- do approach with a small hop on one foot. The second leg is extended forward; hands enter the top, tilt your body and bring your hands to the floor. Do (in vertical plane) max - the leg on which you did the swoop;- next - courbette jump and flip 180 degrees. It is important that your hands are repelled from the floor without bending – has to work the shoulder girdle. Legs occupying the position of the hands. 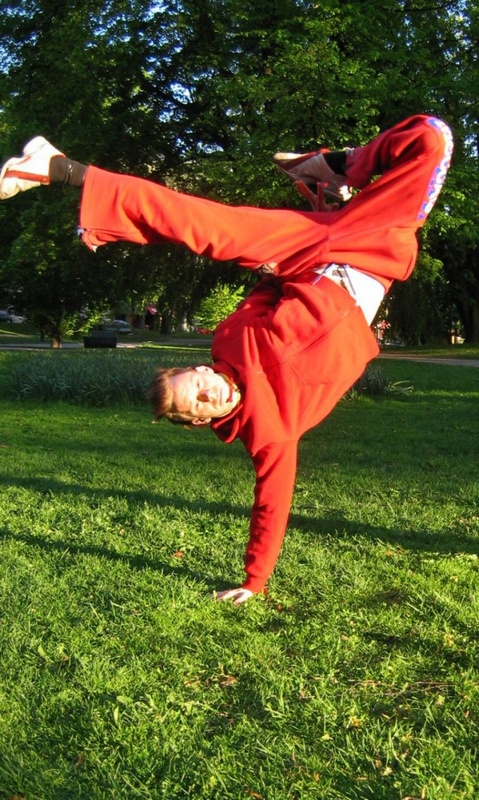 If after landing you mechanically begin to move backward (that is, asking the subsequent acrobatic techniques of the type place), rondat can be considered mastered. To properly perform rondat, certainly consult an experienced trainer with a good reputation. In the self-study of acrobatic elements initially, you are risking to make errors in technique, and relearn will be difficult. Watch the performance of rondat. You'll notice when setting the hands and feet of the novice acrobat is not on the same line, with deviations to the side. This greatly distorts rondat.